The Statue of Liberty, formally known as “Liberty Enlightening the World”, is located at the New York-New York Hotel and Casino in Las Vegas, Nevada. A much larger version of the statue can be found in New York Harbor, and my research indicates that the east coast version actually predates the one in Vegas. In fact, the statue off the southern tip of Manhattan was dedicated on October 28, 1886. It was a gift from France, commemorating the friendship between that country and the United States. The sculptor was Frederic Bartholdi; his creation, which is 151 feet tall, is made of copper sheets that were hammered into shape by hand. The sheets were then attached to a framework designed by Alexandre-Gustave Eiffel. As you may have guessed, he is the same man who dreamed up the Eiffel Tower, the main attraction at the Paris Las Vegas Hotel and Casino. When the statue was completed in 1885, it was disassembled and shipped to New York. The U.S. had been trying to figure out where to put it — when you get a gift that weighs 225 tons, you can’t just stuff it in the hall closet. There was space for it on what was then known as Bedloe’s Island, and money was raised to build an appropriate pedestal. Once that was finished, the Statue of Liberty was reassembled at its present site. In 1982 it was discovered that the arm holding the torch had not been properly attached, causing it to sway in strong winds, potentially risking… uh, disarmament. It was also noted during Lady Liberty’s physical exam that the head had been installed a couple of feet off center. Movement in the wind caused one of the rays of her crown to scrape against that same arm. These signs of wear and tear were corrected in time for the statue’s centennial in 1986. The headline on this piece is a little misleading, since it implies that there are only two Statues of Liberty. 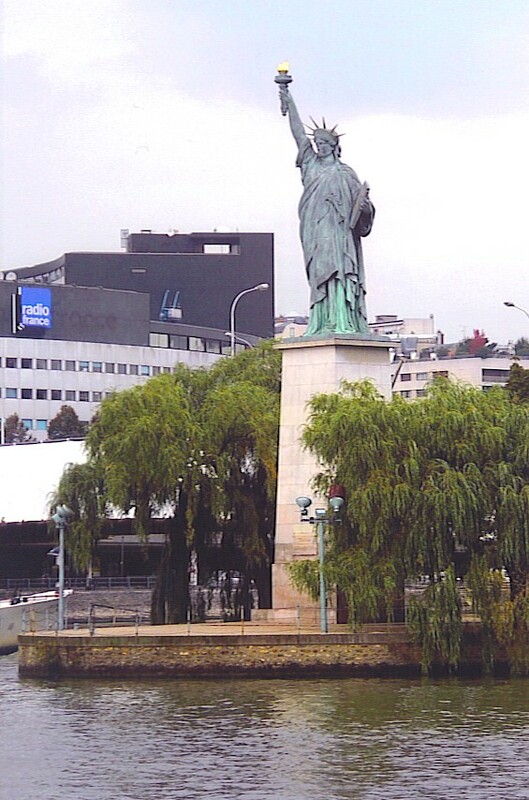 The truth is, there are hundreds of replicas of Bartholdi’s creation in places like Norway, Japan, and Australia. There’s one in Duluth, in Birmingham, in Fargo. Harrisburg (PA) used to have one made of venetian blinds, and I read about a large one made of Lego “bricks”. For all I know, your neighbor may have a Statue of Liberty bird feeder. The “other” one I was thinking about, though, is in Paris, France. Paris actually has three of them, but there’s one in particular I wanted to mention: It’s on a man-made island in the middle of the Seine (see photo). My wife and I discovered it more or less by accident — we spotted it from the Eiffel Tower (the one in Paris, not Vegas). It was apparently given to the French by expatriate Americans a few years after the real one settled in New York Harbor. Sally and I studied our map and figured out how to get to this statue on the Île des Cygnes (Swan Island). It’s only a one-fifth scale replica, but — at least on the day we were there — had the virtue of drawing only a handful of visitors. Lady Liberty stands serene and beautiful, facing west toward her big sister in New York. We enjoyed our visit to this unpublicized attraction, and didn’t mind one bit that there wasn’t a craps table or slot machine nearby.